Vmate App Cricket Days – Vmate is again back with Cricket Days Offers &This time Vmate is offering PayTM Vouchers along with Mobikwik & Shopclues Vouchers all useless for Just Logging in. You will get a New Voucher daily. First of All Download Vmate App from playstore. Now Click on Account Icon & Login with Your FB or Google. Now Click on Rs. 175 icon & Signup using your Mobile Number. You can use it to Recharge Your DTH Number on PayTM App. Vmate App Women’s Day Dhamaka – Vmate is again back with Women’s Day Dhamaka &This time Vmate is offering PayTM Vouchers for Just Logging in. You will get a New Voucher daily. There is no minimum purchase required for some vouchers. This Contest is valid till 2nd Jan so Grab a New Coupon daily. Now Click on Rs. 5000 icon & Signup using your Mobile Number. Now, You will see Option to Get Rs.50 & Rs.5000. Just Scroll below & Click On Any Hashtag & Join the Event. 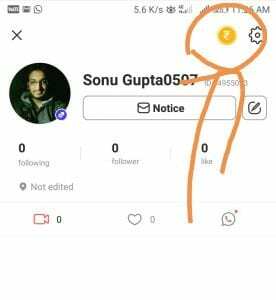 You can Click on get button & Loot Rs.30 PayTM Recharge Code. You can use it to Recharge Your Mobile Number on PayTM App. If You are under Top10 of the Day, you will get Rs.5000 payTm Voucher from Vmate App. If you don’t want to make a Video, You can Upload any of available video on internet & after You upload Video, You will Get Cashback Voucher for Sure. Now Click on Rs. icon & Signup using your Mobile Number. Now Complete all the Steps on Completion each step on a New day You will Get Rewards. There are Three Steps of total Rs.700 for equal Paytm Vouchers. 1. Each Gift Card can be used once per user. 2. 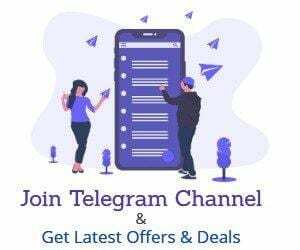 All Paytm and MobiKwik Gift cards are valid till 10th Feb 2019. 3. Paytm Recharge and DTH is valid on registered mobile number. Shopping voucher is applicable on Paytm Mall. Movie voucher is valid on purchasing min 2 movie tickets. DTH is valid on minimum transaction of Rs.100. 4. Rs.50 MobiKwik gift card is valid on minimum recharge of Rs.50 on all prepaid mobile operators in India. 5. Please make sure to apply the promo code before clicking on “proceed to pay”. 6. Paytm and MobiKwik Gift card Cashback will be credited within 24 hours of successful transaction. 7. This Paytm cashback offer is being extended by One97 Communications Limited for using your Paytm Wallet. 8. If you have not completed your Paytm KYC, you will receive Goldback (inclusive of 3% GST). 9. For any complaints and issues please raise request directly on Paytm App at ’24X7 help’ section and Mobikwik chat support 24X7 help centre. 10. VMate, Paytm and MobiKwik reserves its absolute right to withdraw and/or alter any terms and conditions of the offer at any time without any prior notice. If you are not getting Rs.450 icon in Vmate App in Dual App – Edit your profile & Add Your DateofBirth & Gender. 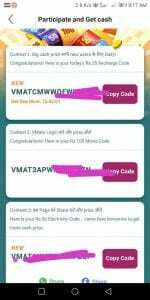 You will see Option Grab This Loot Fast as this may expire anytim More detail Added in Post . ?Rs.50 DTH Vouchers are valid till 10th Jan so Grab Them & use For Free DTH Recharge. ?If you have any query regarding Unlimited trick please comment on post using below link & we will reply in a moment. Promo codes will be applied to each product. Keep Applying to every product. You can add 10 products in single-cart & apply the promo code to every product. If You have Xiaomi Mobile create a Dual App or In other Phones Download any Parallel Space App & create A New Clone for the Same. Once You Create The clone App Now Don’t Login With FB. Just log in as Guest & Complete Your Profile Add Your Date of Birth. You will See Rs.300 Icon in the Top. 2. Each user can get: Three gift cards in successful completion of contest 1(once per day). Two gift cards on completion of contest 2 (once per day) and One gift card on completion of contest 3 (one time). 3. 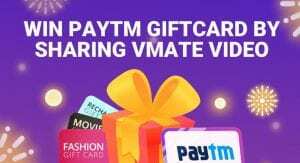 All Paytm Gift cards are valid till 10th Jan 2019. Zomato voucher is valid till 31st Dec 2018. 4. No minimum transaction value for Paytm and Zomato voucher. 5. Recharge and DTH is valid on registered mobile number. Shopping voucher is applicable on Paytm Mall. Movie voucher is valid on purchasing min 2 movie tickets. Electricity is valid on Electricity transaction. Zomato is valid on the selected restaurants (Max discount is Rs.100). 7. Paytm Gift card Cashback will be credited within 24 hours of successful transaction. Zomato user will have instant discount of 50% (upto Rs.100). 8. This Paytm cashback offer is being extended by One97 Communications Limited for using your Paytm Wallet. 10. For any complaints and issues please raise request directly on Paytm App at ’24X7 help’ section and Zomato chat support 24X7 help centre. 11. VMate, Paytm and Zomato reserves its absolute right to withdraw and/or alter any terms and conditions of the offer at any time without any prior notice. You will Get Rs.50 PayTM Coupon For Electricity Payments. You will Get Rs.50 Shopping Voucher. You will get Rs.100 Movie Voucher(Valid on Two Movie Tickets). There are Three Steps of total Rs.300 for equal Paytm Vouchers. Just log in as Guest & You will See Rs.300 Icon in the Top. Duration: November 1st – Jan10th. Sirf ek video share karein daily aur jeetein 100% ASSURED Gift card daily! Ek user Max 3 gift card jeet sakte hai. One gift card per person per day. Gift cards will be sent to you by SMS sirf 24 hours mein.Sirf ek he mobile number use kare poore campaign mein.Saare Gift cards sirf Paytm par valid honge.After sharing video Status change ho jyega “you win gift card” within 1 minute. If not changed re enter again in activity page. 4. Recharge Gift Card is valid on registered mobile number. 5. Movie Gift Card is valid on minimum 2 movie tickets. 8. This cashback offer is being extended by One97 Communications Limited for using your Paytm Wallet. 13. VMate and Paytm reserves its absolute right to withdraw and/or alter any terms and conditions of the offer at any time without any prior notice. Sonu Gupta Is Founder of Bigtricks .in, Part Time Blogger And Btech Computer Science Student. He Likes Blogging and Software Designing. Dreams Plastic Modern & Plain Assorted Night Lamps. Mere paas 2 Account hai..aur ek par bhi koi bhi ek product pe bhi nahi lag raha code…kuch bhi order nhi kar paya hu..code hai lekin paytm pe bol rsha ki “use only once per user”,,???? Kyaa karr…??? ?